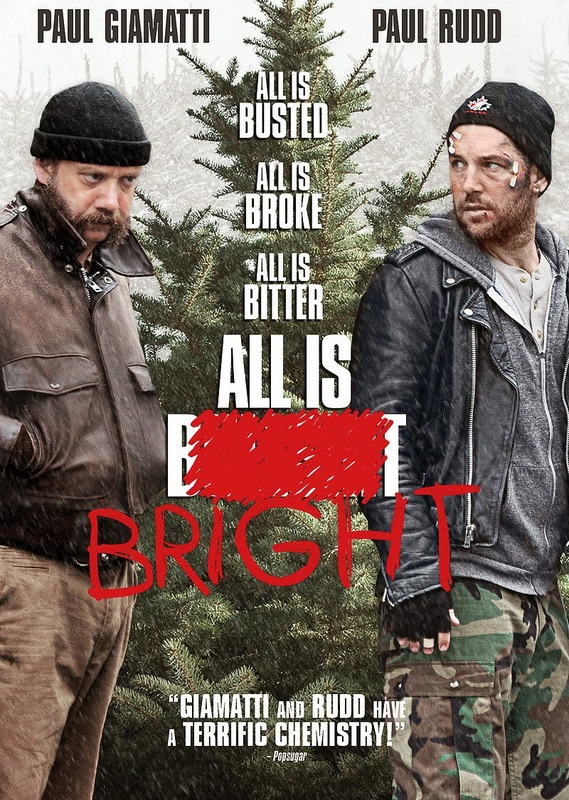 All is Bright centers around a paroled thief played by Paul Giamatti, who returns to his home in Quebec to discover his wife is seeing his best friend (Paul Rudd). She's told his daughter that he died of cancer, and doesn't want her to learn otherwise. Despite being furious with his friend, Giamatti's character approaches him for a job. Together, they drive to New York City to sell a truckload of Christmas trees. It sounds like a premise with some comic potential, but the movie goes in a different direction. It's generally described as a dark comedy, but it doesn't really fit in that category. It has a handful of jokes - some of which are hilarious - but they're few and far between. For the most part, the movie skews closer to drama. This is a Christmas movie about poverty and desperation. It's about people who want to put their lives back together, but have no real chance of succeeding. Even if the world wasn't completely apathetic to their situation, they wouldn't know where to begin. Giamatti plays his character with surprising realism. You believe he just got out of prison and is at the end of his rope; at times, he's downright scary. At the same time, you can't help sympathizing with him. He wants to do something good for his kid. He thinks that means buying her a piano: by the end, he realizes it means giving her a lot more. The critics weren't kind to this one: it pulled a score in the mid-40's on Rotten Tomatoes, and the positives are generally lukewarm. I'll chock that up to critics wanting something that fits more cleanly in the comedy category - I find professional reviewers have trouble when movies don't clearly belong in one genre or even a cross-section of genres. All is Bright does a great job building a tone that mirrors Christmas at its worst. It's a good glimpse into what it's like being miserable at the holidays and trying desperately to reclaim some sense of meaning out of the time. It's not for everyone, but if you can appreciate a sadder, darker, look at the holidays, you might want to check this out. We enjoyed it quite a bit. I would watch that. I have a wonderful family that enjoys their holiday together, and am grateful for that, but I agree with you on the critics- a lot of times, they just don't know what to do with it if they can't plop it neatly into the middle of the road.